Pakistan Telecommunication Company Limited (PTCL) after successfully being recognized at GSMA for its world class services, is now also nominated for AMO Awards. 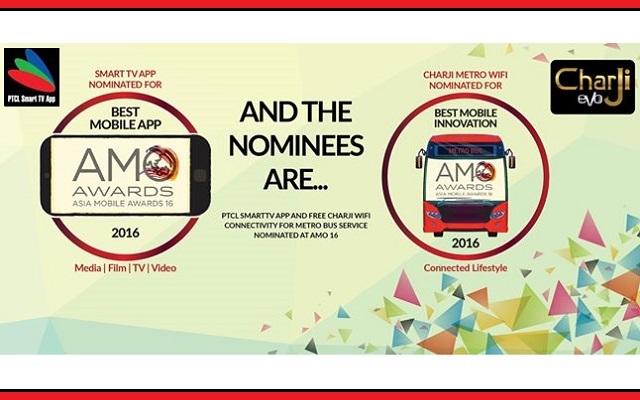 PTCL ‪SmartTVApp‬ & CharJi‬ ‪‎Metro Bus‬ Free Wifi Service Nominated for AMO Awards‬ 2016; whose results will be announced on 29th June, 2016. PTCL CharJi‬ MetroBus‬ Free Wifi service in Islamabad/Rawalpindi has been nominated for Best Mobile Innovation whereas SmartTVApp‬ has been nominated for Best Mobile App at AMOAwards‬ 2016. The Smart TV Mobile App was launched in 2015 and it has around 150,000 users. This app has had the credit of being nominated in the Mobile World Congress awards 2016 in Barcelona for bringing exclusive content like live ad-free Cricket World Cup. Not just this the smart TV app has also facilitated i OS And Android users to watch 140+ live TV channels and up to 5,000+ hours of movies, dramas and kids content. Similarly the Charji Metro Wifi service is providing highly innovative Wifi system on all 66 buses and 24 stations of the Metro Bus service. “The AMO Awards” are the sister awards to the GSMA’s Global Mobile Awards (The Glomos), the mobile industry’s world leading awards programme. The AMOs recognize everything from game changing mobile devices and technologies to applications and services available in all Asian markets, showcasing the ever growing value that mobility brings to users, to industries, to businesses, communities and economies across the region.